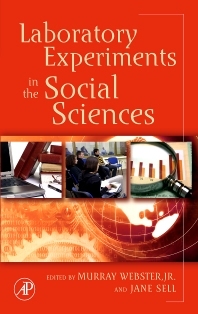 Laboratory Experiments in the Social Sciences is the only book providing core information for researchers about the ways and means to conduct experiments. Its comprehensive regard for laboratory experiments encompasses “how-to” explanations, investigations of philosophies and ethics, explorations of experiments in specific social science disciplines, and summaries of both the history and future of social science laboratories. No other book offers such a direct avenue to enlarging our knowledge in the social sciences. This collection of original chapters combines instructions and advice about the design of laboratory experiments in the social sciences with the array of other issues. While there are books on experimental design and chapters in more general methods books on design, theory, and ethical issues, no other book attempts to discuss the fundamental ideas of the philosophy of science or lays out the methods comprehensively or in such detail. Experimentation has recently prospered because of increasing interest in cross-disciplinary syntheses, and this book of advice, guidelines, and observations underline its potential and increasing importance. The book will be used in methods classes and for work in social science laboratories in sociology, marketing, political science, anthropology, economics, and psychology.